'Plantation Beau' ( Mary Dunn, R. 1984). Seedling L79-80-1. LA, height 38" (97 cm), Midseason bloom. 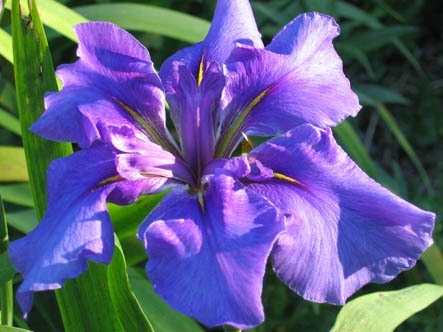 Ruffled smooth violet, deeper around small spear shaped signal of lime green; violet styles. L18-74-16: ('Queen O' Queens' x 'Mrs. Ira Nelson') X 'Dark Tide'. Bay View Gardens 1985.